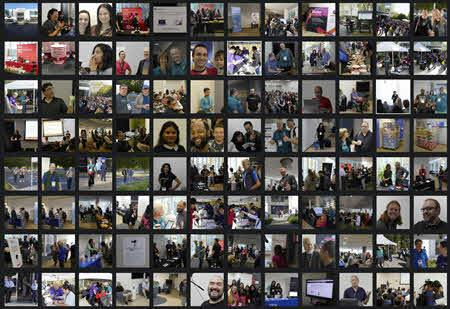 SVCC News - SV Code Camp #12 Pictures Posted! SV Code Camp #12 Pictures Posted! We are trying not to get good at changing venues but I feel that our third move to Pay Town Hall is the best yet. PayPal was an awesme host for us this year and I can't say enough positive things about how welcome we felt. First, a big thank you to PayPal for hosting us. Our speakers, our Sponsors, our volunteers as always stepped up and continued to make code camp an awesome community experience. Over the next few days I'll be encoding all the sessions we recorded in the three Town Square rooms, and posting on our YouTube channel (join the 3000 other subscribers there to be notified as they post). Many thanks to Kenny Spade of Microsoft for driving all 3 cameras. I've also just uploaded a bunch of pictures I took today and are linked to below (several people asked me if the professional photographer had taken pictures of all sessions. Sadly, no and not professional (just big camera). Don't forget to do your SV Code Camp and Session Evaluations. Once you login, we've got one page that you can easily do them all from. PS: PayPal has asked us to help them by sending a developer survey. We will be sending it out in a week or so. As a thank you to PayPal for their support, when you get it, please respond.